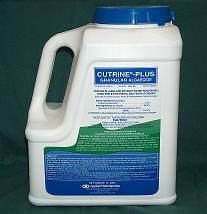 CUTRINE-PLUS also acts as a herbicide in controlling Chara, Nitella, Filamentous Algae, and the rooted underwater weed Hydrilla Verticillata. CUTRINE-PLUS is U.S. E.P.A. registered for use in drinking water reservoirs, farm fish and industrial ponds, golf course water hazards, lakes, fish hatcheries and raceways, irrigation water conveyance systems such as canals, laterals and ditches. APPLICATION RATE: For spot treatment, apply directly over infested area at the rate of 1 pound per 720 square feet (72' X 10'). Large areas should be treated at the rate of 60 pounds per surface acre (208' X 208'). METHOD OF APPLICATION: A dry fertilizer spreader may be used to ensure even distribution on large areas. When treating small dockside or swimming areas (1/5 of an acre or less), broadcast CUTRINE-PLUS GRANULAR in the same fashion used in spreading grass seed. Spot treatment of problem areas is easily accomplished as CUTRINE-PLUS granules are readily visible through the water, permitting pinpointing of treatment on target algae.